Merry Christmas from the Valiantes! Take a moment to read our “Year in Review” in our 2017 Family Christmas letter. Please take a moment to check out our update for December 2017. This has been a really special month. Read the update to learn more! The Scripture tells us that “it is required in stewards, that a man be found faithful” (1 Cor 4:2). This text is situated within one of the most extensive sections of Scripture detailing the work of a minister of Jesus Christ. In the previous chapter, Paul uses the imagery of a building to illustrate the importance of building our ministries upon the sure foundation of Jesus Christ (1 Cor 3:11). Once the foundation is set, it is up to the builder to use materials that will endure—gold, silver and precious stones—rather than materials that cannot withstand the test of fire—wood, hay, straw (1 Cor 3:12-14). As Paul expresses, one of the keys to a “successful” ministry is being faithful to the calling God entrusts a person’s care. This point is highlighted by the usage of the word “stewards.” This term brings out the concept of a “manager” (specifically a manger of a household). Once again, the image of a “building” or “house” lingers in our minds from the previous chapter. Every “minister” is entrusted with a different responsibility to oversee (we could call it a different place in the vineyard to tend). But the key to success (wherever God places you in his service) is to be found faithful. This past weekend, our family had the joy of being with the Hubble Family and Noxen Bible Baptist Church. When I think of a man being found faithful, I think of Pastor Ben. I knew Ben from my time at Northland, and even then I knew him to be a godly, consistent example of faithfulness to the Lord. So, this past Sunday it was a joy to see Ben and Heather’s steady, consistent ministry to the folks, not just within their own congregation, but within the community as well. Being from the area in which God has called them to serve, their heart for children and families within the community was a powerful testimony to me. They clearly have a desire for God to use them to lead folks to the saving knowledge of Jesus Christ. Our prayer is that God would honor their faithful service and continue to bless the ministry to which they have been called. Words cannot express how meaningful and special this past Sunday was to our family. We are so thankful for the opportunity to present our ministry at Bensalem Baptist Church. If you were not able to make it, here is the video of our presentation, and the message I preached from 1 Thessalonians 1. Twenty-two years ago this month I sat in a service at Bensalem Baptist Church wrestling with deeper questions than most fifteen year olds might wrestle with. In other words: “I needed to do something about it.” As strange as it may sound, there had never come a time in my life when I recognized the need to turn to Jesus Christ by acknowledging my sinfulness and trust Him as my only hope of salvation. Before this point in my life I probably would have said I believed “in” Jesus. In other words, I believed He existed, and I would have even affirmed that He was the Son of God. But I can truthfully say I had never believed “on” Jesus. I had not yet rested my confidence for both this life, and the life to come upon Him. My hope for eternity had not yet been committed to His trust. It was plainly evident that His death ultimately had no bearing on my life. Up to this point I had not yet realized the depth of my sin, nor how it subtly controlled my life. What I would have claimed to “believe in” did not transform who I was or what I did. But all of that changed in November 1995. I saw clearly (for the first time) that I needed to exercise faith in the Lord Jesus Christ. I saw my need for Him, but above that, I desired Him to enter my life, cleanse me from sin, make me His child, and lead me from that point forward. I can honestly say it was on that day I began my relationship with God. 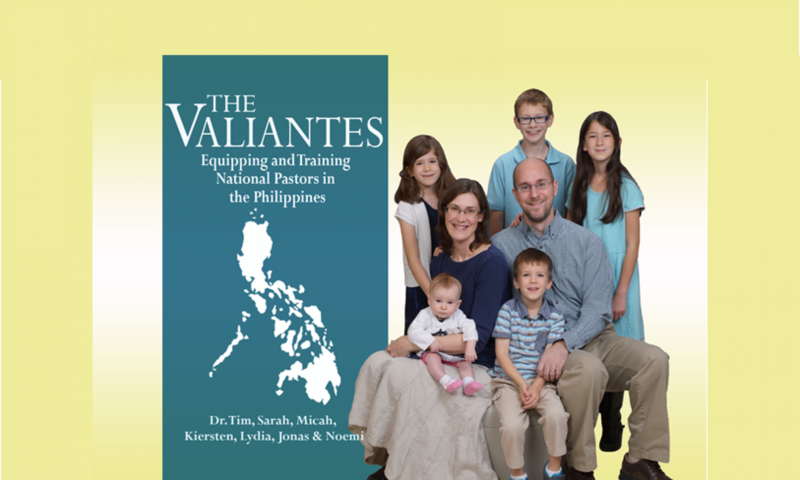 #1 – I am looking forward to presenting our ministry to the Philippines and preaching at Bensalem Baptist Church this coming Sunday. I count it a great honor to preach in the place where God opened my eyes to see my need for Him. If you are able to be there, I hope you can join us in 11:00 AM Service in the main auditorium. Looking back over these twenty-two years, I am very grateful for the work God has done in my life. I am glad that when I called upon Him, Jesus was there to answer the call. I am far from perfect, but I see the impact the gospel has made in my life. This relationship with God has given me peace, a hunger to know Him more through His Word, and an abiding desire to obey and serve Him. Today, this is what drives me to go to the Philippines in order to teach pastors how to more effectively study God’s Word so they can joyfully obey and serve Him in their own ministries. If you have yet to come to experience this kind of relationship with God that can only come through faith in Christ, I hope you will come to Him and see the gospel make the same impact in your life. Our travels this past weekend took us to Kendall Park Baptist Church in Franklin Twp. NJ. This congregation welcomed us with open arms and we enjoyed sweet times of fellowship with their pastor and church family. Pastor Brown actually served as the senior pastor of Emmanuel Baptist Church from 1998-2008 (this is the same church I pastored from 2010-2017). On account of this connection we share a unique bond. The fellowship with this dear brother and his wife was very sweet. When you meet the Browns, you will quickly learn that they love to spend time with people. We were over their house on Saturday night and Sunday afternoon, and on both occasions they had invited others from the church to join in the festivities. Another connection we have with this church comes through Tri-State Bible Camp. Every Spring, Emmanuel would take a group to Tri-State’s Work Retreat. This is a time to help with various projects on the campsite getting things ready for the camping season. Over the past few years, our time there coincided with Kendall Park Baptist Church’s. This has afforded us some tremendous opportunities for fellowship. In addition, Micah and Kiersten went to camp at Tri-State this past summer, and they met many of the children from Kendall Park there as well. Kiersten was especially blessed over the weekend getting to spend time with lots of girls right around her own age. This has always been a struggle for Kiersten (finding friends around her age), so we were so glad to see how much fun she had with the young ladies at Kendall Park. Our time at Kendall Park was a refreshing experience for our entire family. We are thankful for the work God is doing there and the blessing they were to us! Long distance travel just got a bit easier for the Valiante Family. Over the past month or two, we have been looking for a good deal on an RV which would help make our longer trips more comfortable. Although most of our meetings up to this point have been within just a couple hours, we wanted an RV for our upcoming cross country trip out West in the late summer / fall of 2018. We also plan to utilize this vehicle for any meetings outside of our immediate area over the coming months. Here is a picture of our new addition… The story of this purchase begins back in the late summer. When we put our house on the market, our plan was to use some of the proceeds from the sale of our house to buy a motorhome. But, when it became clear that we would be renting our home out instead of selling it, I said, “We’re definitely not going to buy a motorhome.” It certainly would have made longer trips more bearable, but it was not a necessity. However, when we found out that Sarah was expecting I quickly changed my mind and said, “We’re going to buy a motorhome!” The thought of traveling cross country in a cramped minivan with an infant was too much to bear. Hopefully this purchase will make things much easier on Sarah during those months with a new baby. After doing some research and looking at available motorhomes online, we saw this one come up on Facebook Marketplace. It had very low mileage (19,300) and was in very good condition for its age. Sarah and I swung by to look at it on Sunday (and really enjoyed getting to know the owner), and we committed to purchase it sometime this week. We picked up our RV today (and took care of transferring the title and registering it). The kids immediately fell in love with it. They enjoyed checking out all of the fun places to sit and hide. Jonas was extremely disappointed that he would not get to sleep in the bunk tonight. Actually, one of the reasons we settled on this type of RV (it called a Class C Motorhome) is because of the extra sleeping spaces. The bunk above the driver’s area could easily sleep all four of our children. The sofa turns into a bed, as does the dining area. And of course, there is a full-size bed in the rear of the coach. Working off of those calculations, we could sleep about 10 if we needed to! (And no, we do not have plans to add 3 more to our family… but the Lord has a way of surprising us at times). We are truly thankful to see the Lord giving us everything we need (and even some things we don’t necessarily need but want). I believe this RV will give be a great benefit to our family during this period of raising support. I would appreciate your prayers for our family as we travel, that the Lord would provide us safety, memorable experiences, and opportunities to minister to others. What makes a person “family”? Of course, the easiest ones to identify are those we are related to by blood. These are the people God graciously puts in our lives to support and direct us from the very start. But as we grow, others come into our lives who (though maybe not related to us by blood), occupy a special place in our hearts. When this happens, our “family” expands to include these folks as well. Looking back over the years, our family has grown to welcome in many people we have met along the way. One such family is the Artmans. We have been so thankful for Mr. and Mrs. Artman and the love they have shown to us (especially to our children). Living far away from both sets of grandparents, the Artman’s have served as “surrogate grandparents” to our kids. The past couple of weeks have been pretty hectic at the Valiante house. We have been packing and organizing to get our home ready for our tenants who are beginning the process of moving in this week. On Friday night, the Artman’s invited us over for dinner (just so we would not have to worry about cooking). The kids had a great time playing downstairs while Sarah and I returned to the house to take care of some additional details. Our kids always love building with Legos at their house. Then (on top of the time she had already spent helping Sarah pack over the past couple of weeks), Mrs. Artman came over on Saturday and spent probably 8-10 hours helping clean the house. An added blessing was when Mr. Artman arrived with pizza for lunch! We have been richly blessed these past few weeks during this transition. Another family we have grown to love is the Rancks. Our children are roughly the same age as theirs and we have enjoyed our friendship with them over the past 7 years. They too invited us over for dinner and last Saturday, they even took our children out for the entire day so packing would go a little smoother for us. While they were out, Christina texted and asked what snack foods Sarah enjoyed, and they came back with almonds, hummus and lots of other great treats. Their thoughtfulness (along with their love and support) has meant so much to us. Family is a blessing from God… in whatever form it comes. Above all, we are blessed to be part of God’s family through faith in Jesus Christ. The other day one of our children asked, “Daddy why do you call people, ‘Brother? '” That was a good question. The reason I call another believer, “Brother” is because we share the same Heavenly Father and have been born into the same family. When a person is born-again, they are “birthed” into God’s family. If you have never experienced a true relationship with God, today can become your spiritual birthday, and you can be born into God’s family through faith in Jesus Christ. He loved us and gave Himself for us that we might experience forgiveness and a relationship with the Father. Please take a moment to check out our update for November 2017! In this update you will learn how we passed the 25% mark of our needed monthly support. What a great month this has been! There is something special about a person’s name. Even if you take a cursory glance over Scripture, you will soon realize names hold great importance to both God and people. In fact, of 10 commands God enumerated for His people, the third one revolves around His name. God’s name represents Who He is (signifying His character and accomplishments), and to take His name in vain is to show disrespect for Him. For this reason a stern warning is issued within the 10 commandments letting us know that God will hold those who use His name in vain accountable (Exodus 20:7). Names are important to people as well. After God names Adam (an act which shows His authority over him [Genesis 1:26]), Adam is then given the responsibility to name the animals (in turn showing Adam’s authority over creation [Genesis 2:19]). Interestingly, it is even Adam who gives his wife, Eve, her name (Genesis 3:20). It has been said that the sweetest word to a person is his or her own name. A precious passage to believers is found in John 10 where Jesus describes Himself as “The Good Shepherd.” In that text Jesus says that those who belong to Him (His sheep) hear His voice and He calls his owns sheep by name and leads them out (John 10:3). God knows us intimately and individually calls us by name. This past Sunday we had the joy of ministering at Steam Valley Bible Church. Something Sarah and I noticed right when we came through the door was that the pastor and congregation had worked hard on memorizing not just my name, or Sarah’s, but the names of each member of our family. From the moment we stepped in, Pastor MacAvoy pointed to each of our children and said, “So this is Micah… Kiersten… (slight pause)—Lydia and Jonas!” There is nothing sweeter to a person’s ears than to hear their own name! But Pastor MacAvoy was not the only one who knew our children’s names. Many members of the church could do the exact same thing. You could tell they had been prepared for our coming and were excited to have us there. Our conversations with the folks made us feel like we were talking to old friends. We were so grateful to connect with this wonderful group of believers. In the evening, we were able to present our ministry at Bible Baptist Church (Shickshinny, PA). We were glad to see the work God is doing within this congregation, and the excitement of their new Pastor (Randy Boston) as he leads this flock. I have known Pastor Boston for a number of years, and am grateful for the Lord’s leading within this congregation to give them a faithful pastor to preach and teach them God’s Word. We had a great time presenting our work and were truly glad for the opportunity. It was another wonderful Lord’s Day, and we are excited about all that God is doing in our lives! As a note the proper name “Adam” is the same as the noun, “man” or “mankind.” Context helps one differentiate the two usages.